Lately I've seen a lot of our younger players emigrate to European leagues. Although this may look great on the surface, we should read between the lines to discern what it means for the MLS and USL. First, player development isn't even at 25% of what it should be. Yes, we've seen great players like Adu and Altidore, among others, come out in recent years. And yet as we browse the internet for soccer blogs and news we realize that the majority of these players come from the USSF's own development system. Some of the MLS teams (New York, to name one) have started to pay more attention to our American-born potentials, but a larger community of quality youth development academies are needed. This is especially true as we witness how the beleaguered MLS superdraft in fact doesn't actually ensure that the top high school and college players remain on our shores (as we've seen recently with DCU's top pick and Bryan Arguez's premature exit). I would hate to see MLS become an international-player-dependent league. Losing local competition can have detrimental effects on the national team if club teams continue this trend and we may see further international failures akin to Germany, England and Spain. We should find common ground and keep the MLS a competitive national league while at the same time have the majority of our marquee players in more competitive leagues. Our youngsters are the future of the game in this country and we want to see our future play the games on our own shores. Hi, there. The time has come for my views on what the starting 11 should be. First, I like the idea of having a young, dominant goalkeeper that is seeking greener pastures in some of the more important teams in Europe. I am, of course, talking about Brad "El Guzano" Guzan from Chivas USA (more on what I think of that team's name at a later date) who is being sought after by Celtic (Scotland) and Aston Villa (England). For the defense I have several problems since we lack real dominant players at this point that we have had in the past. Long gone are the days of a good Alexi Lalas, Marcelo Balboa, and Eddie Pope. Instead we have Carlos Bocanegra (I like him on set pieces), Oguchi Onyewu (a little iffy but has more experience), Maurice Edu (young player with plenty of stamina and possibly a great future ahead) and Jimmy Conrad (a surprise pick but I like the way he handles the middle of the defense). Things become clearer with the midfield, which I find is solid for the US squad at this point. 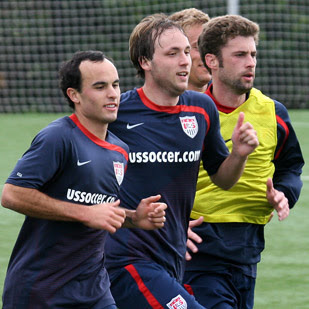 I would start Landon Donovan (25 yrs old and nothing short of impressive), DaMarcus Beasly (dominant player in a famed club--Rangers), Clint Dempsey (best US player at this point), and Michael Bradley (coach's son but what a player indeed!). Up at the top I would put Jozy Altidore without question. As to whom I would choose as a companion is a bit more difficult. McBride has retired and Mathis is no longer a viable international. Freddy Adu is more of a midfielder so that won't work either. I also don't like the idea of putting Donovan or Dempsey up front because they are needed for creating plays in the middle of the pitch. I have three other options: Eddie Johnson, Taylor Twellman, and Brian Ching. 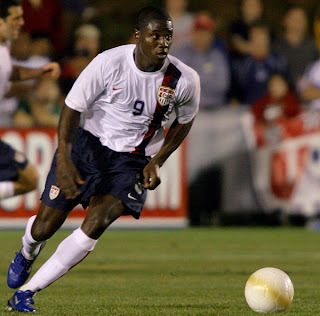 Eddie Johnson plays more like Altidore (sidelines and quick slants). Twellman lacks the international spark that some other players have and Ching is just not playing that great at the moment. What we need is a downhill player that is opportunistic and dominant in the center of the area. I would stick with EJ at this point. Until we find a real center forward and a more confident defense, I think we'll be stuck in the second phases and quarterfinals of the World Cup (if that). Recently, thankfully, MLS has been linked with a possible spot in the CONMEBOL's Copa Libertadores in the 2009/2010 season. Why all the fuss? Well, let's look at it this way... 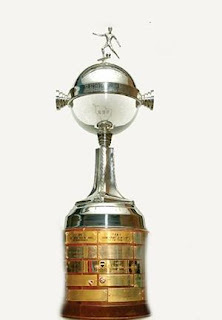 The Libertadores happens to be the oldest international club tournament and has a storied past with aces like Pele and Alberto Spencer taking part. Currently it sits only below the famed UEFA Champions League in importance. Lately there's been a limited amount of presence by the MLS in international tournaments, namely the CONCACAF Champion's Cup and the Sudamericana. CONCACAF's move into a Champion's League-style tournament is a step in the right direction for our local soccer confederation but the quality of teams will still be limited. Personally, and I don't think I'm alone in this, I feel it's imperative to have MLS teams participate in the Libertadores for further exposure of our national players and to make international competitions another important objective for league teams. I have no problem with the playoff system currently in place in the MLS but I would like to see the league play time extended by at least one or two months to be more in sync with the rest of the world. Participation in international tournaments will, I think, help to usher in a more standard league time frame. And.... who in South America or Mexico doesn't want to see players like Beckham, Blanco, Angel and other potential high-level acquisitions league teams might make in the coming years?! Here we go again. If the rumors (and these are pretty solid) are true then another one of our young prodigies [Eddie Johnson] is preparing to emigrate to better soccer fields. The main interest comes from Derby County and others include Fulham and maybe a minor Spanish team. So, given the information, should we be glad or concerned. EJ has had an illustrious carrier so far. 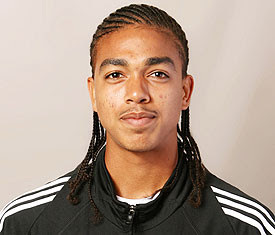 Five goals in his first 2 games for the United States in WCQ 2006! 15 goals in 24 games this past MLS season. I like the idea of having him as one of our regulars with the national team, someone to compliment Jozy Altidore as a second half sub. As to whom we should pick as a starter next to Altidore--well that's another blog. I'm still saddened by the fact that Real didn't follow through with Jozy. But Derby? No offense to their fans, but we have to admit that Derby is worse than subpar at this point in the EPL. Only 7 points! Surely we can come to the conclusion that they will not return to the premiership next season. So are we going to have one of our marquee players in the English second division? I find this disconcerting. Fulham would be a step up, although they also currently reside in a precarious position on the verge of relegation. In fact, were the season to end right now, both teams would be out of the EPL. I'm not quite sure about which Spanish team is also vying for EJ's services. Hopefully it's a top-flight or a least a middle-of-the-road team. I hope that Fulham is able to come to and dig themselves out of the pit. After all, here's where we have Clint Dempsey, arguably the best American player. In any case, I hope EJ makes a good decision... Who knows, maybe he's able to get Derby out of its horrible slump. Hard to imagine, but football is not logical.